Submitted by mark on Wednesday, April 18th, 2018 at 4:28 pm. 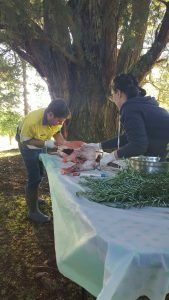 Heritage New Zealand’s Property Lead, Te Waimate and Hokianga Properties Alex Bell preparing a spit roast Hogget for the recent Waitangi Day cricket match at Te Waimate Mission. All in a day’s work – Alex’s third day of work actually. For Ohaeawai resident Alex Bell, taking on a new role with Heritage New Zealand Pouhere Taonga is a bit like coming home. The 31-year old was recently appointed Heritage New Zealand’s Property Lead, Te Waimate and Hokianga Properties; a role that involves the management of New Zealand’s second oldest surviving building – Te Waimate Mission – as well as Mangungu Mission in Horeke and Clendon House in Rawene. Alex has a particularly strong link to Clendon House. “Dennis Cochrane, who was the father of Jane Clendon, was one of my ancestors. Jane, who married James Reddy Clendon, was instrumental in keeping Clendon House in the family after his death until it was eventually gifted to the NZ Historic Places Trust in the early 1970s,” says Alex. Discovering physical evidence of his ancestors on family land as a child was instrumental in forming an interest in history according to Alex. “The objects I found poking out of the banks of the Hokianga Harbour were likely disposed of by them, so those old spoons and whiskey bottles created a more personal link between them and now,” he says. Highlighting links that help bring history alive, as well as making stories and information accessible to the community, are objectives Alex wants to explore in his new role. “I love to get into the gritty parts of the stories, and to find historical tidbits to incorporate into the story of a property or archaeological site that give it some personal context,” he says. Each of the physical buildings sit in landscapes that incorporate centuries of Maori settlement and politics, and have their own stories to tell. “Te Waimate Mission is an untapped treasure – and that goes for Mangungu Mission and Clendon House too. There is a wealth of stories to be told beyond just those of key historical figures,” he says. Te Waimate is a far cry from Western Australia where Alex worked as a contract archaeologist prior to returning to New Zealand. He is enjoying being able to walk through knee-deep grass without having to worry about standing on a sleeping snake, or surveying in the bush and getting covered in kangaroo ticks. Neither does he miss being away for weeks at a time, the relentless heat and sleeping in a swag by the fire. “I certainly loved it there, though. A beer at sunset with your mates after a 10-hour work day in 45 degree heat, looking over a mountain range of premium grade iron ore – that’s the good life,” he says. After working as an archaeologist in the north following his return from Australia, Alex is looking forward to the next step of his heritage journey. And his family connections make it all the more personal. “One of my ancestors, William Robinson, is buried in the Mangungu cemetery – so this job is kind of like caretaking a bit of family history I suppose,” he says.